Office 2010 Classic Menu for Excel, Word, PowerPoint, Access and Outlook display the original classic drop down menu and tool bar navigation in Microsoft Office 2010 as in versions previous to Office 2007. Office 2010 Classic Menu brings back the familiar menus and tool bars to Microsoft Office 2010 allowing work with Office 2010 as if it were Office 2003 or before. 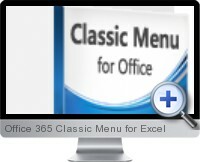 Office 2010 Classic Menu includes the classic menus for Word, Excel, PowerPoint, Access and Outlook 2010. All the new features in Microsoft Office 2010 are available within the menu contents. Office 2010 Classic Menu also supports all languages that are supported by Microsoft Office 2010 including English, French, German, Italian, Spanish, Portuguese, Japanese, Chinese, and more. Office 2010 Classic Menu reduces training resources by providing a smooth learning curve for all Office 2010 versions suites. Easy to enable or disable the menus and tool bars. Easy to deploy to client computers in a enterprise or organization. Quickly find and execute the menu command that is needed. Press Alt-Q-Q to use the familiar keyboard shortcuts to browse the whole menu. Add the menus and tool bars to the Quick Access Toolbar and use Office without the ribbon. For Office 2007, there is also Office 2007 Classic Menu.